The practical application of augmented reality service is buzzing everywhere; each sector is leveraging this wonderful technology to innovate something new and useful. Sectors like tourism, automobile, construction, software are embedding this concept into their products. One field in which AR is playing a major role is in the education field; students have a better chance to know things in a more practical approach. The trend of educational augmented reality apps is buzzing high. The future of education is AR; schools are building Augmented Reality Classroom where augmented reality projects for students in biology, physics, chemistry and much more will be explored, and the students will get a comprehensive knowledge of the particular topic with the help of educational augmented reality apps. The boring subjects will be much interesting with a touch of virtual reality. Students will get a chance to know how actual things work and what is behind the scene of twisted concepts. In physics, the teacher can teach students derivations in a fun-oriented way, geography teacher can explain various geographical lands in a much detailed way, and the applications of AR goes on. The augmented reality service is the future of new learning methodologies. AR classroom is the coolest example of AR in education where teacher and students can interact with each other on a topic explained in a “virtually real” way. 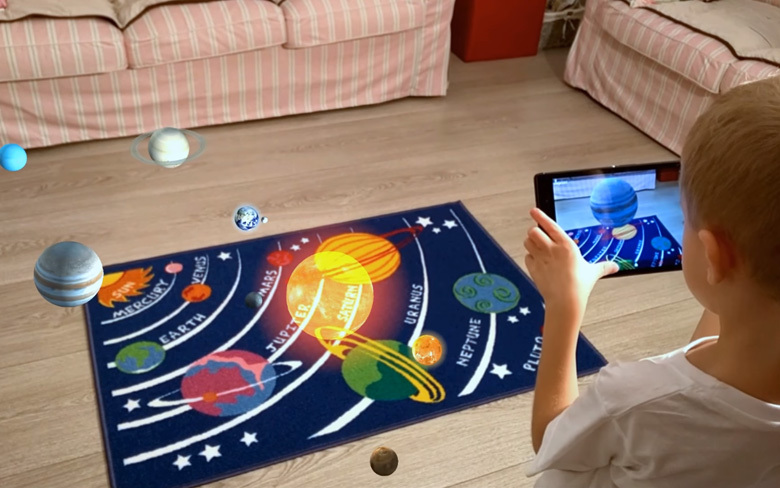 There are many best augmented reality apps for education are available which schools can leverage to enhance the learning. Study of difficult concepts like the theory of relativity, chemical reactions, space & time concepts and much more can be summed up in a simple and structured manner. Implementing augmented reality in education examples like medical surgery, simulation practices, complex structural designing and much more will make the studies easier. The use of AR will bring a contextual approach to studies. The concepts learned from books can be understood in an even better way. Student’s engagement in studies will be increased with this amazing concept. Students tend to show more interest in studies when things are more practical and contextual. This is one of the most useful purposes of augmented reality applications in education. The very first step towards a great design is understanding your needs. Our team of engineers take care of every tiny and prominent detail and your requirement and suggest you the best solution for your requirement. Whatever your need is small or big, we always offer you the best prices for your dream design. We have designed superior design packages for your every need. You don’t need to think twice while outsourcing your work to our experienced engineers. At ZealAR, we offer a comprehensive range of AR services so that we can offer you the best in class services to shape your imagination into a real object. We also develop the best augmented reality apps for education as per your school requirements so that you can provide quality education to your students. We work in various 3d printing domains including 3D scanning, 3D designing, 3D prototyping, CNC, Tool designing and making, Vacuum casting, Injection tooling molding and much more. You don’t need to look somewhere else when you are with us.